As part of our continuous updates to bring you the best, we updated the True Blue PowerPoint templates collection to now include extra PNGs, wide screen variations, and added options to purchase through PayPal, and order a CD. 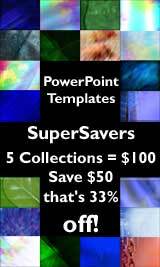 Of course, the actual designs were updated too -- at no extra cost for you -- all individual PowerPoint template collections on Ppted.com are still just $30 for a set of 5 templates! Add these to your collection today.